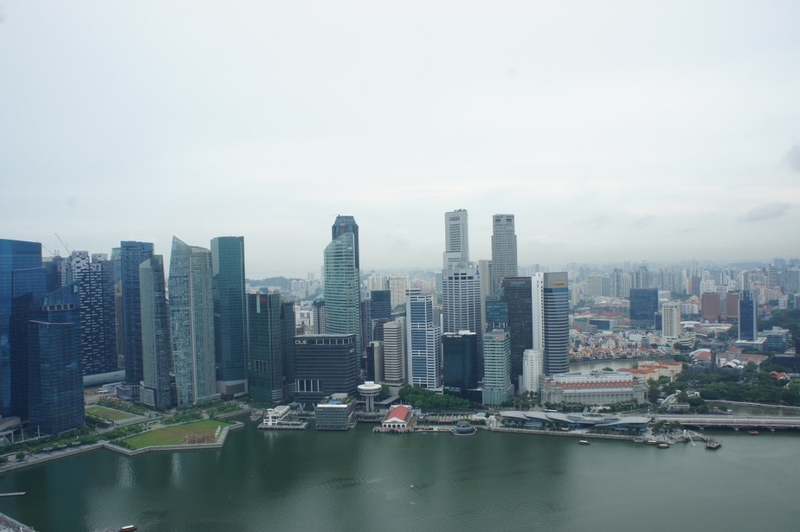 We were originally planning to fly from Cambodia straight to Indonesia but our flight had us connecting through Singapore so we decided to extend our layover to check out the city for a few days. Once we landed at Changi Airport, we took the super-efficient local train system (SMRT) to the Little India neighborhood where we stayed for the next three days/two nights. We checked in to Wanderlust, an old school converted into a modern boutique hotel, and dropped our bags in our room to grab lunch at Cocotte, the restaurant on the ground floor. 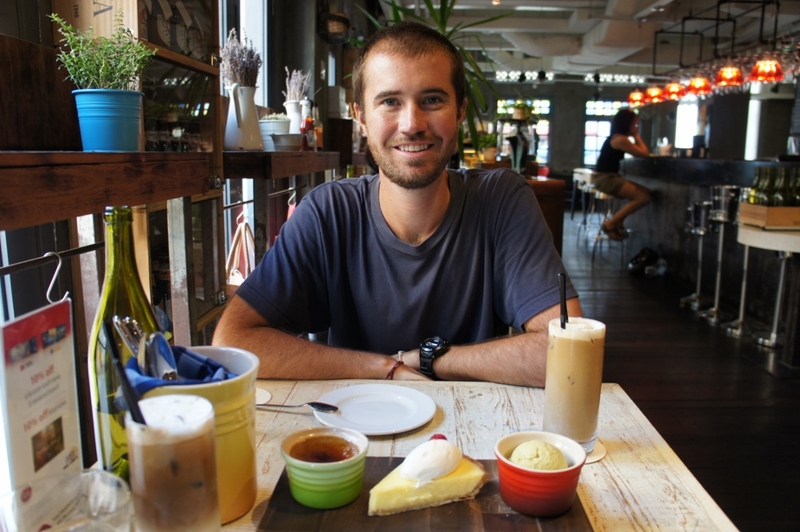 Singapore is world-renowned for its incredibly diverse food inspired from all over the world. 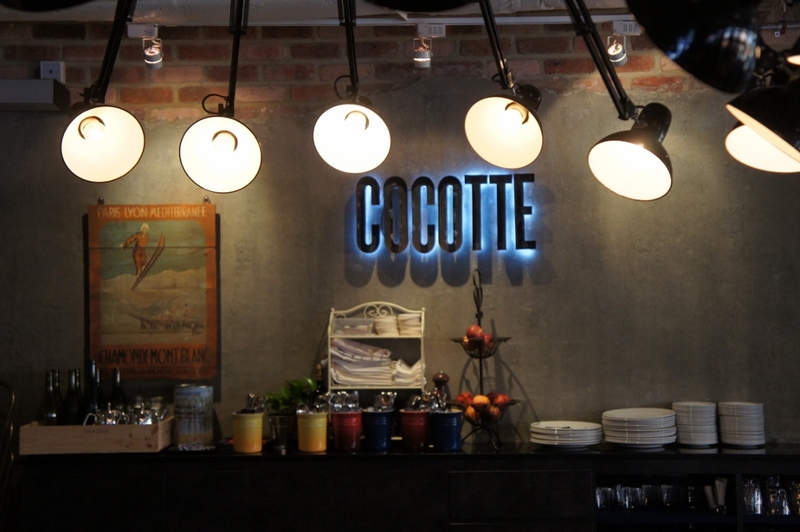 Eating is a national pastime and a staple to the culture so we weren’t surprised to hear that Cocotte was a French-inspired restaurant. We took our seats at one of the tables. The décor was a cross between a rustic farmhouse and French bistro with a splash of hipster for good measure. It was adorable! We enjoyed our Arnold Palmers while Chef Anthony prepared a few of the restaurant favorites for us. 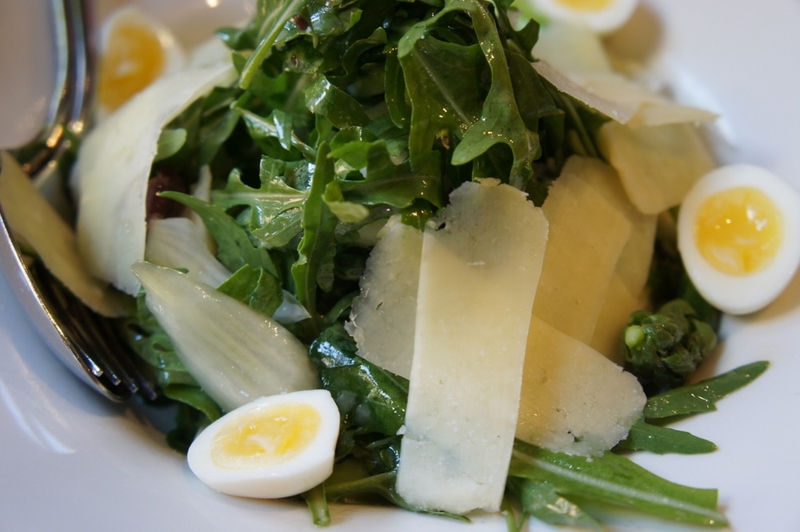 The first course was an asparagus salad topped with laguiole (a French cheese) and fennel tossed with rocket leaves, boiled quail eggs and a citrus dressing. It was light, fresh and crisp. So tasty! The salad was paired with one of our favorite dishes of the day…a foi gras mousse served with toast and a port wine/cherry preserve. 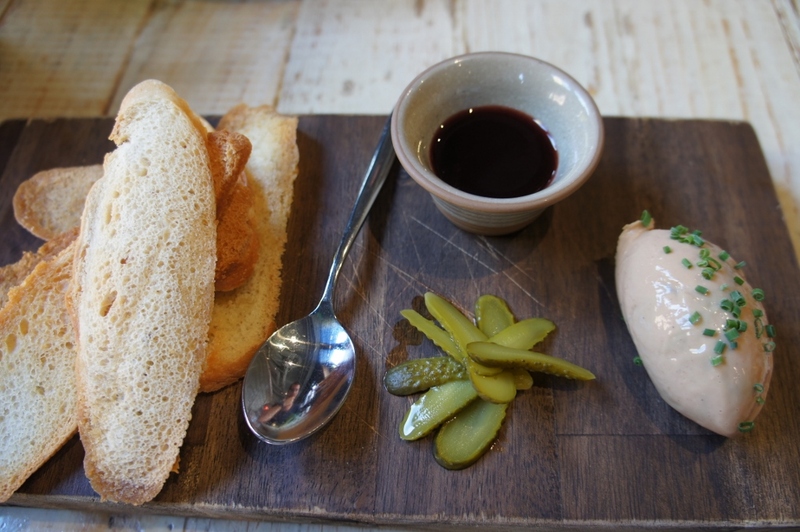 It was savory and rich but sweet from the sauce with a little snap from the baby pickles. So good. Next up were two different sandwiches. 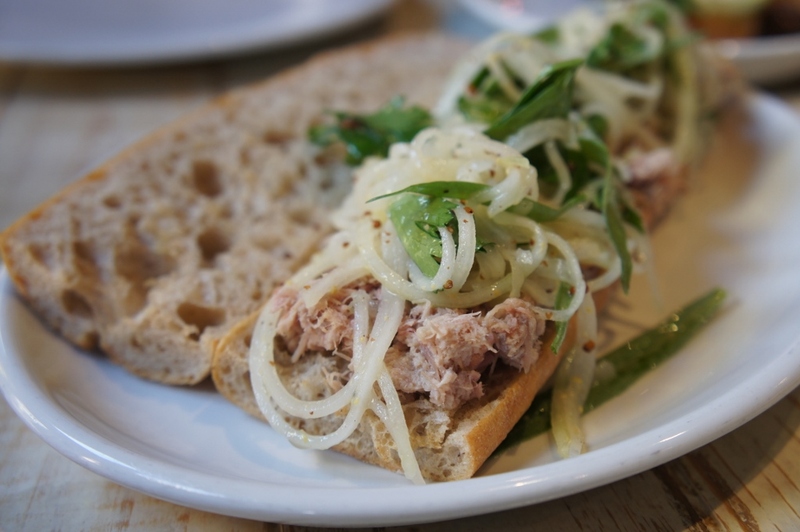 The first was a shredded pork sandwich made of Australian pork shoulder, wholegrain mustard dressing, tarragon, parsley and cucumber on a country baguette. For those of you who don’t already know, I’m a sucker for baguette sandwiches and this was no exception. 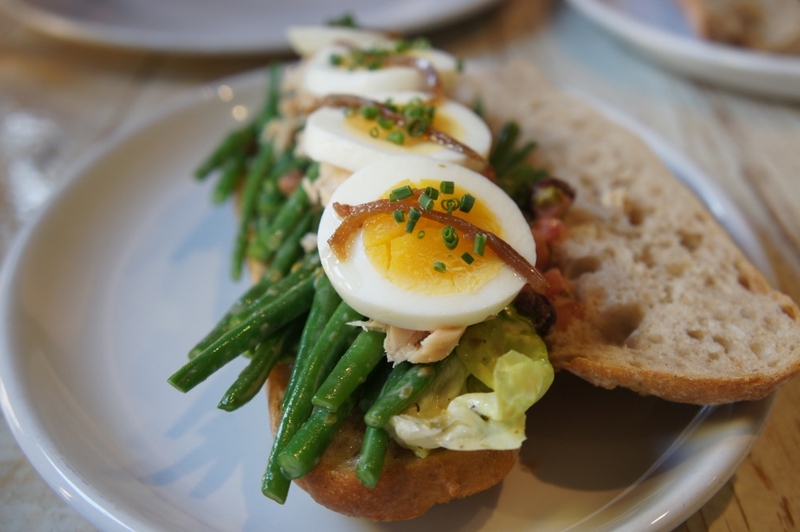 The second was a modern twist on the classic tuna sandwich which included tomatoes, nicoise olives, a long line of green beans (which provided a good crunch), hard boiled eggs and garlic aioli on a toasted baguette. Chris, who doesn’t usually like tuna sandwiches, loved it and claimed it was his favorite of the two. 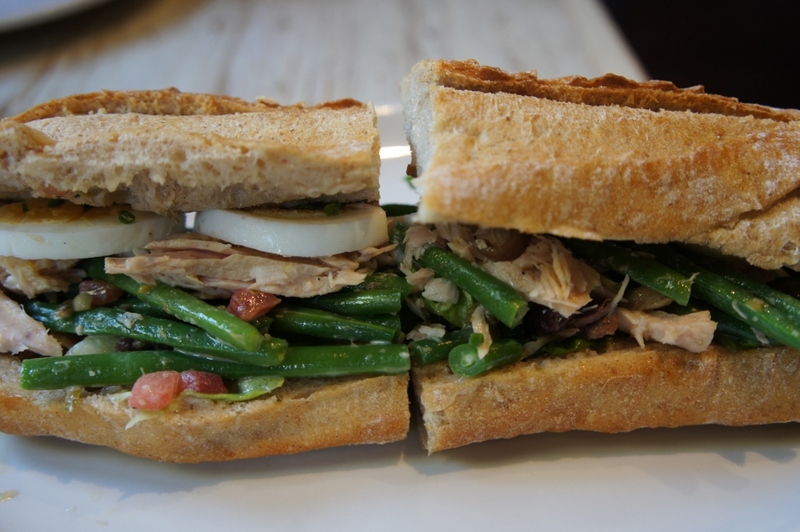 For Chris to favor a tuna sandwich over a pulled pork sandwich says quite a lot! True to the restaurant’s French roots, they also had a bakery serving up delicious pastries, cakes and desserts. We were lucky enough to try a trio of desserts with our iced coffees (a perfect pick-me-up to help us through our long travel day). 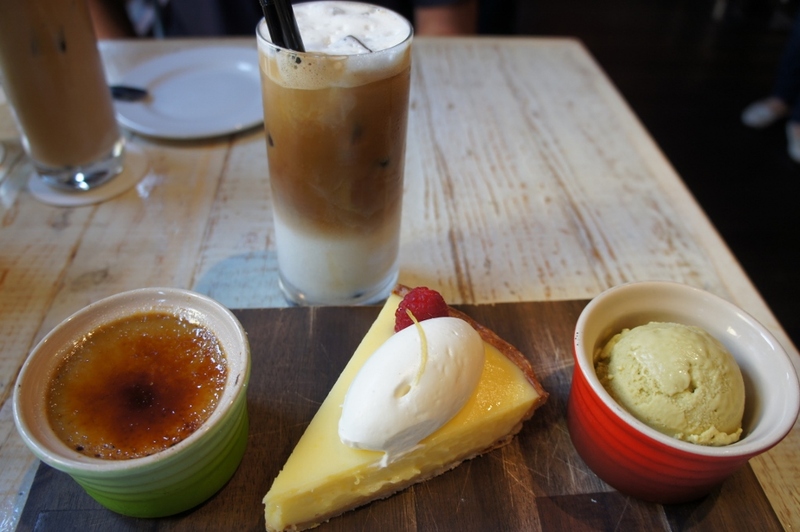 Starting from the left was an Earl Grey-flavored crème brulee, followed by a lemon citron tart and last but not least, pistachio ice cream. They were so good, but my fave was the tart and Chris’ was the crème brulee. Any way you look at them, you really can’t go wrong. 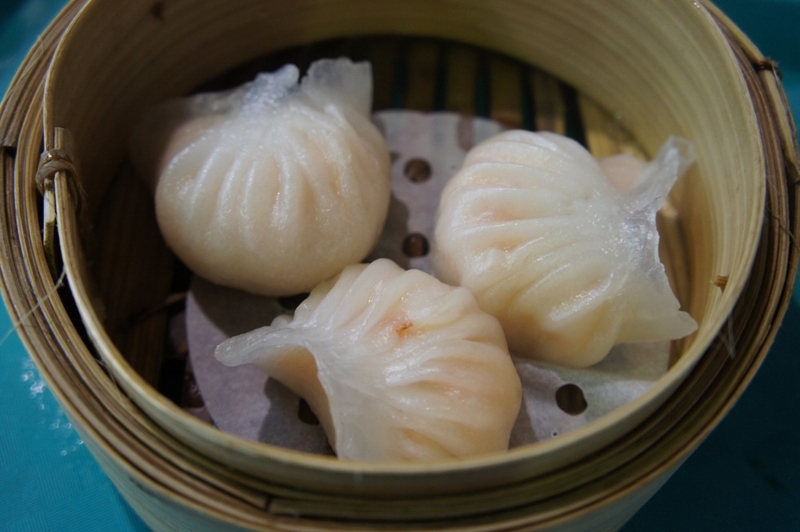 Our first taste of Singapore did not disappoint – everything we had was delicious. 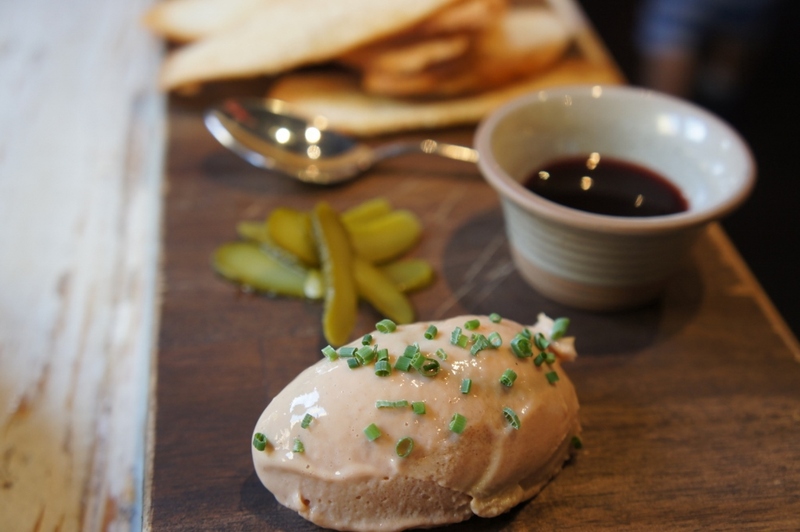 Our sandwiches were served a la carte so if you’re really hungry, be sure to order an appetizer (we highly recommend the foi gras mousse) or save room for dessert! We were there for lunch but Cocoette also serves a prix fix dinner menu which changes regularly and brunch on weekends. For more information or to make a reservation, visit their website. Thank goodness we didn’t have to walk far after eating. We took the elevator to our room on the second floor. Every floor on Wanderlust has a unique design and theme created by a local design agency and ours was the Pantone floor. 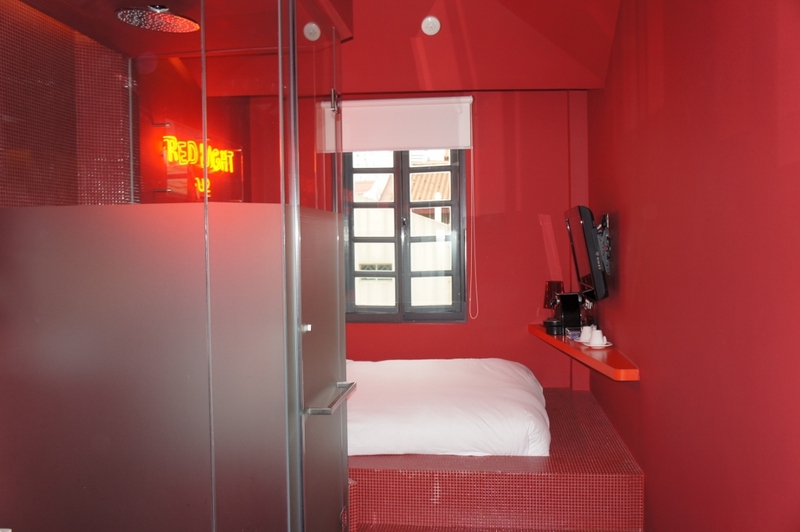 Each room is painted and furnished with one specific color. Ours was a nice, deep gray but we were given a tour to see a few of the brighter rooms as well. 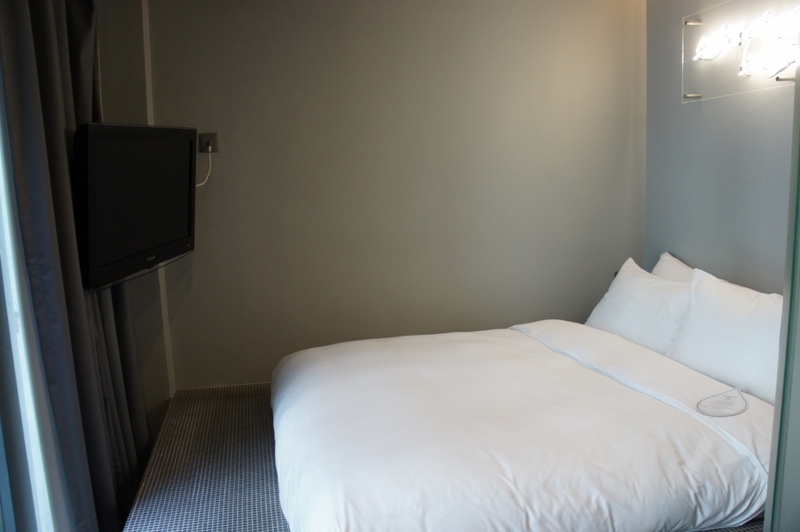 Space can be a challenge, especially for hotels in major cities, but Wanderlust designed the room for maximum efficiency and practicality. The rooms were perfectly designed to fit everything we could want: super comfortable bed, bathroom, separate shower room with high powered raindrop showerhead, vanity, table and chair, flatscreen tv, espresso maker, mini-bar with complimentary non-alcoholic drinks restocked daily and down the hall was an outdoor patio with Jacuzzi. I have to reiterate, the bed was amazing – super comfy with full body pillows. It felt like you were sleeping on a cloud. 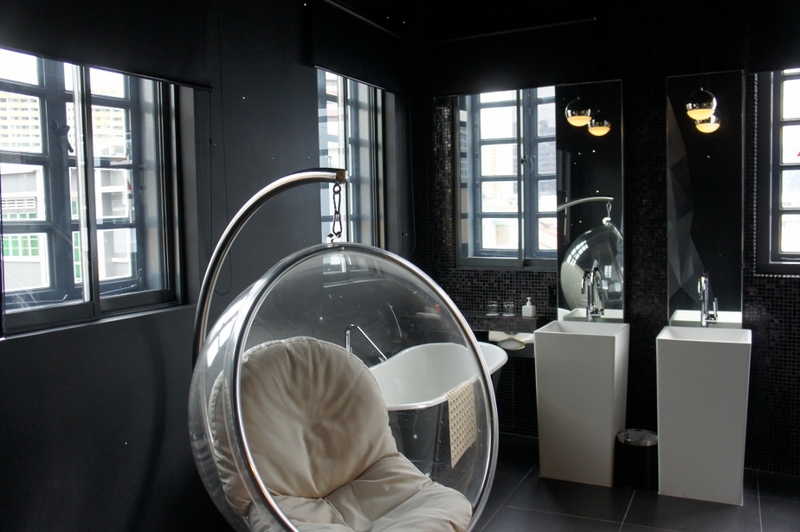 The rooms on level three are black and white, a striking contrast from the rooms on the Pantone color floor. 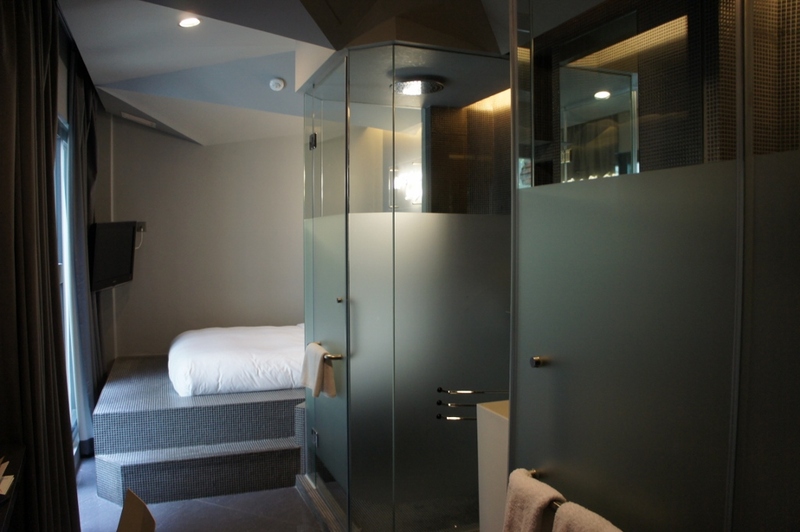 The fourth floor features rooms with their own individual theme like the ‘typerwriter’ or ‘tree’ lofts. 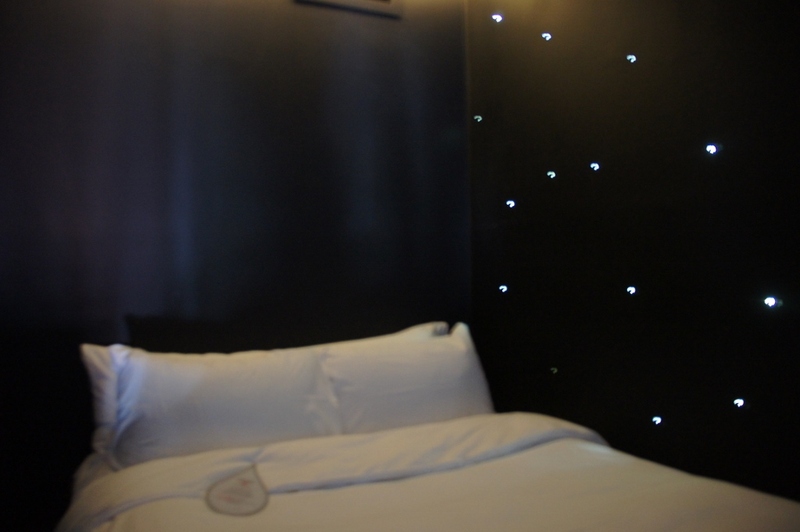 We were shown the ‘space’ room, the most requested room in the hotel featuring lighting resembling stars around the bed and space capsule-like chairs which were very cool and very different. We let our food settle before heading out to see the city. 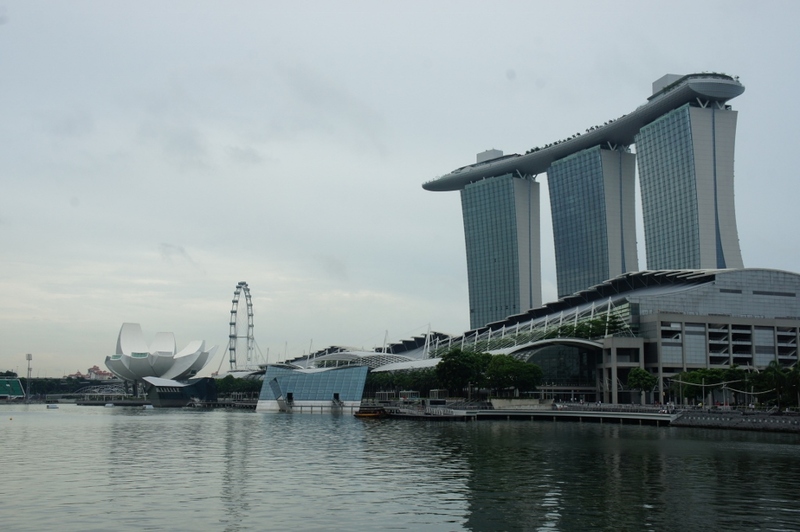 We walked everywhere…through Little India, the riverside and the city center until we reached the waterfront for views of the infamous Marina Bay Sands Hotel, Art & Science Museum (shaped like a lotus flower) and surrounding city skyline. 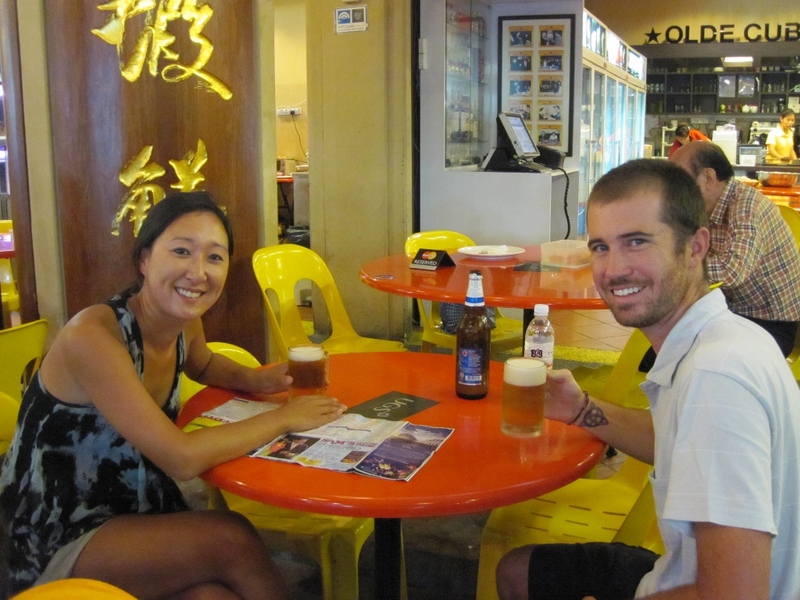 We continued on to Chinatown where we stopped for a beer and to people watch. Our plan was to grab dinner at a street hawker center (food court) down the street, but when we went to pay for our beer, we realized we forgot our wallet at the hotel. Oopsie. We were at least a 45 minute walk away and while we discussed what to do next, a fellow traveler sitting at the table behind us offered to pay for our beer (one Tiger beer costs upwards of $7). We were lucky and so grateful for a fellow traveler’s kindness. We walked back to our hotel, showered and got ready for a night on the town. By this time, it was past normal dinnertime so we took the train from Little India back to Chinatown for some late-night grub. My heart was set on eating ‘chicken rice’ from the Maxwell Street Hawker Center (more on this later), but by the time we got there the food stall had closed so we settled on a noodle dish from a nearby stand. We walked back to where we had our beer earlier in the night thinking the nice man who paid for us may still be there and we could pay him back, but he was gone. We sat to have a few more drinks before heading on. 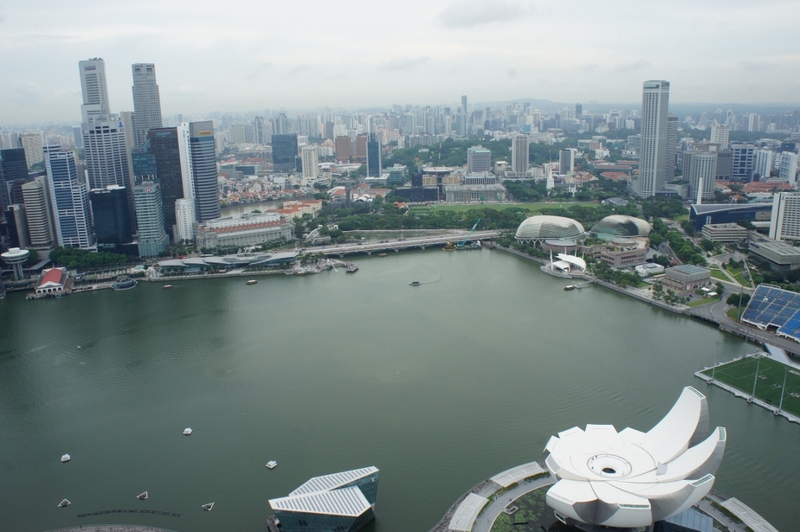 With such a short time in Singapore, we wanted to experience the city as a local. Enter Casey Penney. I met Casey when I worked at Edelman in Chicago. She’s from NY but has lived in Singapore for the last two years and when I found out we’d be in town for a few days, I knew just who to call. 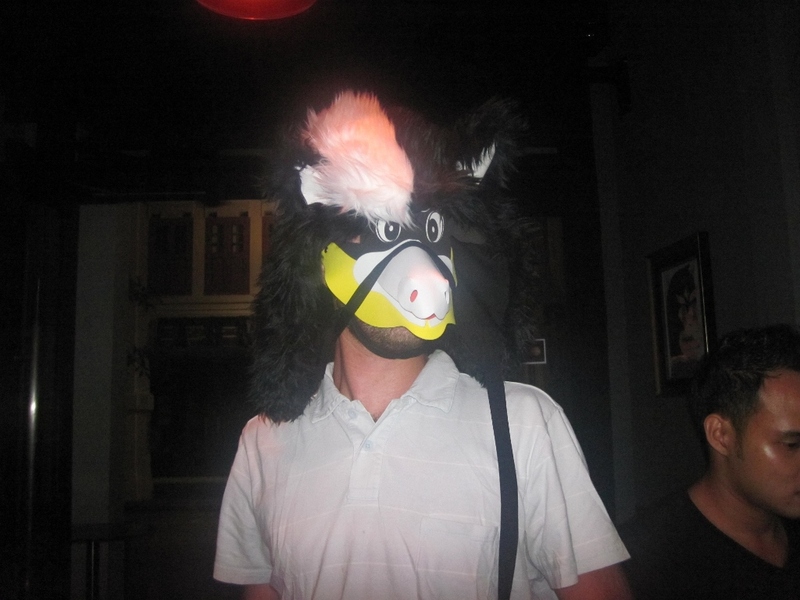 We met up at a bar a few blocks away where her friends’ animal-themed 30th birthday party was taking place and where Casey was dressed as a skunk. After catching up over a few drinks, Casey and her boyfriend brought it back old school style by breaking out round after round of beers and jaeger bombs. 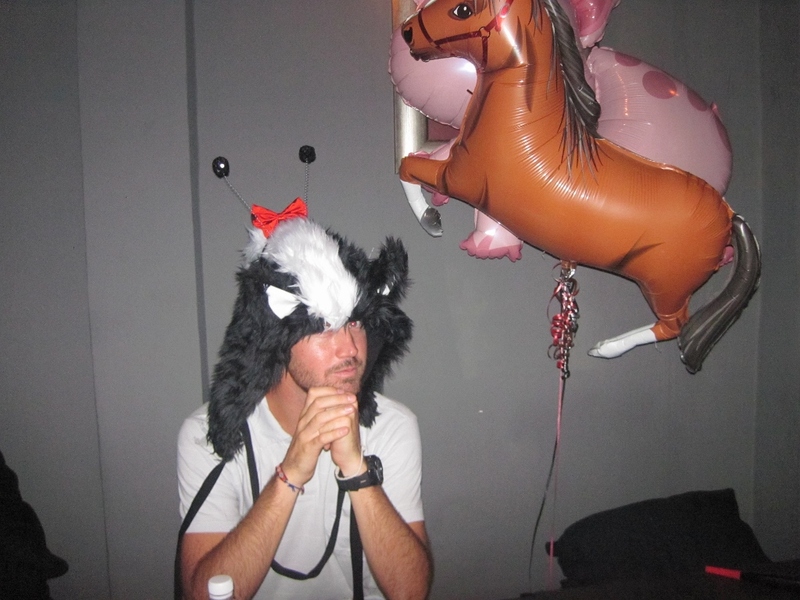 Apparently Casey’s skunk hat and other animal accessories made it around the bar that evening. Next thing we know, we’re in a taxi with a few of her friends heading to Zouk, a popular nightclub where we danced the entire night away. We never expected such a crazy/incredible night to unfold (and later found out that Zouk is ranked as one of the top five clubs in the world). Thanks a million to Casey, her boyfriend Patrick and all of her friends who were so nice and so generous. Singapore is super expensive and they paid for almost everything all night long. We owe them big time! The night was so fun but the next morning was not. The redeeming factor for waking up the next morning was getting to go back to Cocotte for our breakfast (which is included in every reservation) and we weren’t going to miss another delicious meal. 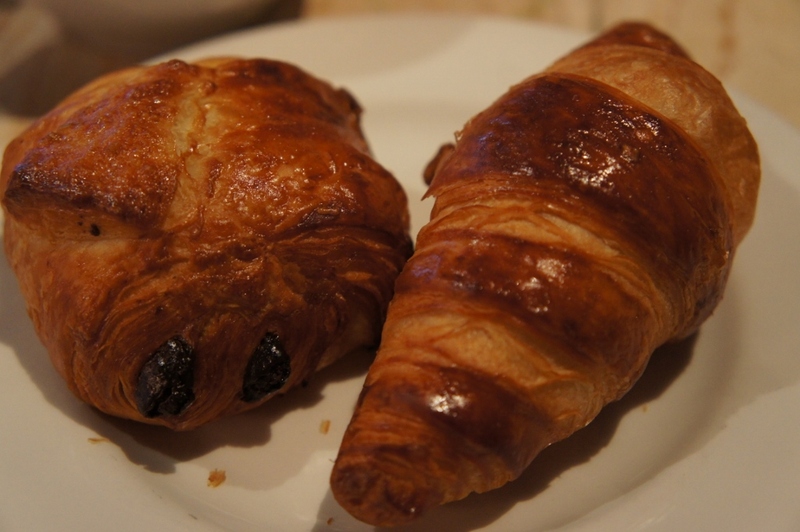 Breakfast starts with fresh croissants and pain au chocolates straight from the oven that melt in your mouth. 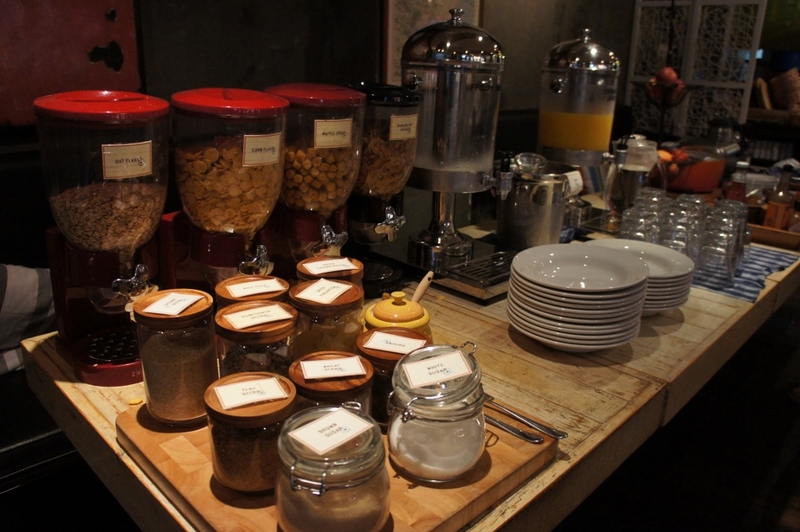 Up next is the breakfast buffet complete with a do-it-yourself cereal and muesli bar, yogurt, bread board, coffee/tea and juice while you wait for your main course to arrive. 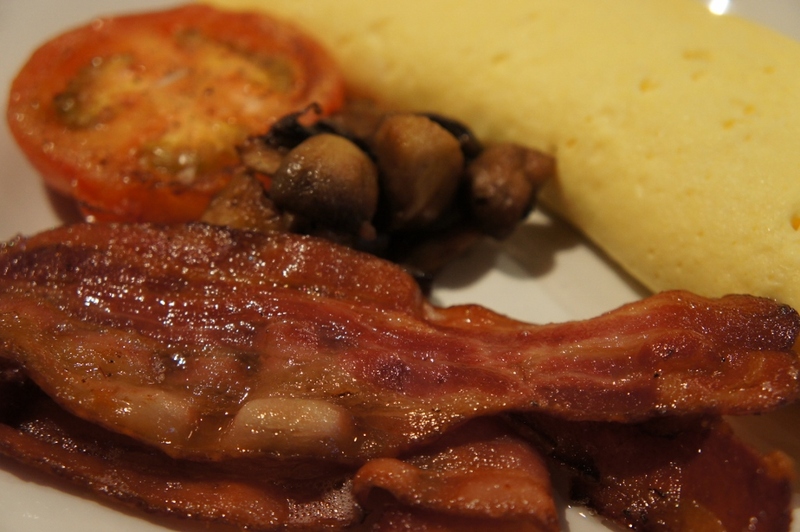 I chose the omelet served with bacon, grilled tomatoes and sautéed mushrooms which totally hit the spot. Chris had homemade pancakes with maple syrup and bacon. 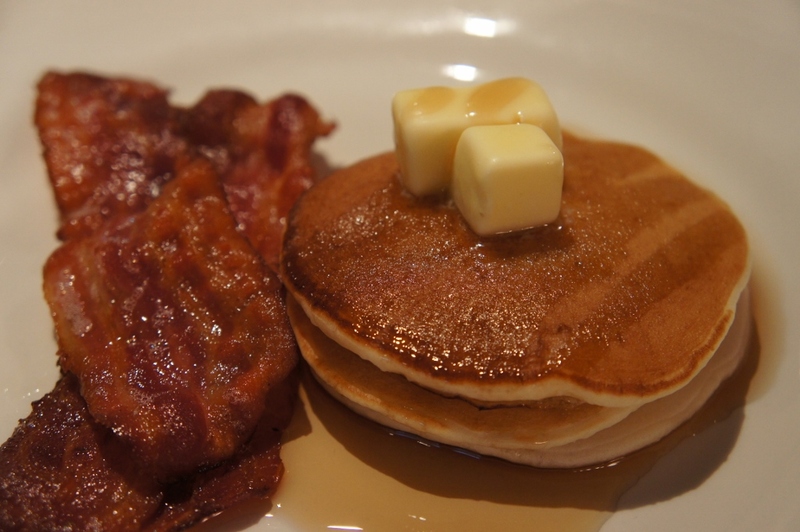 It’s been so long since we’ve had thick fluffy pancakes and proper bacon (for sure the best bacon we’ve had on the trip). 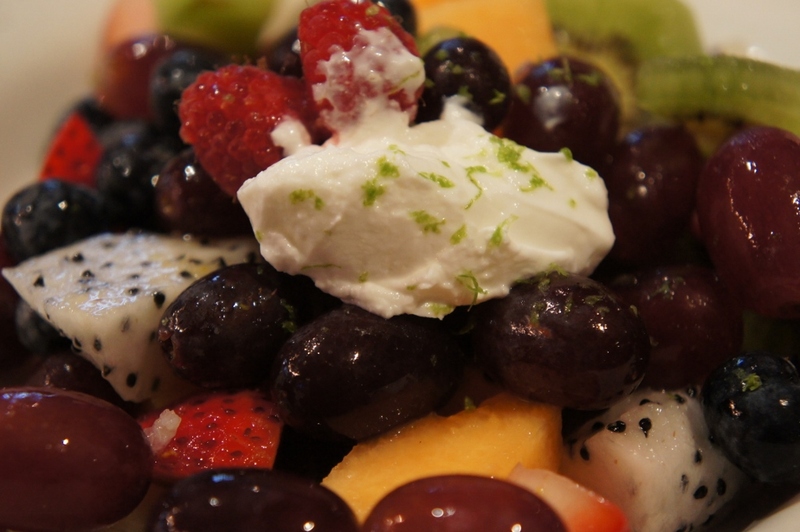 The second day, he chose the fruit bowl which was a mix of bananas, papayas, melons and berries tossed in a citrus-honey chardonnay dressing topped with Greek yogurt and fresh lime zest. It tasted just as good as it looked. After breakfast, we contemplated lying in our amazing bed for the rest of the day but finally willed ourselves out the door and into the world. Breakfast was just the beginning of what would be our food tour of Singapore. Once more, we found ourselves back in Chinatown at the Maxwell Street Hawker Center. 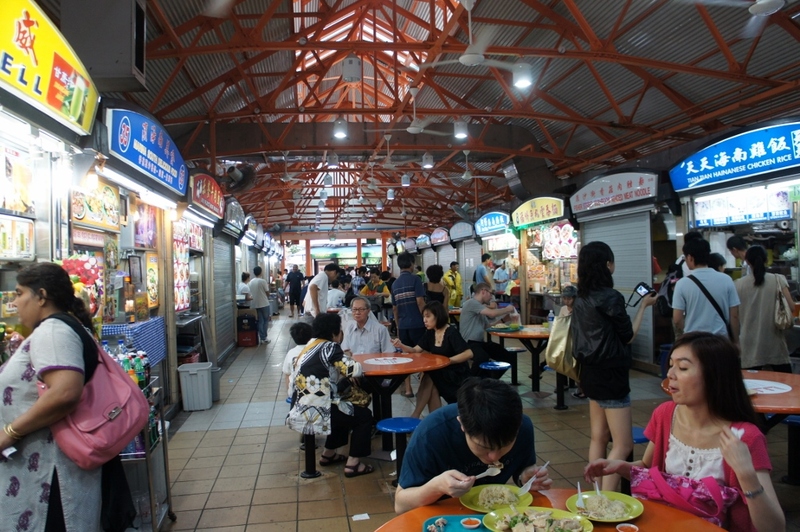 Hawker centers are food courts where food stall after food stall sell cheap meals. 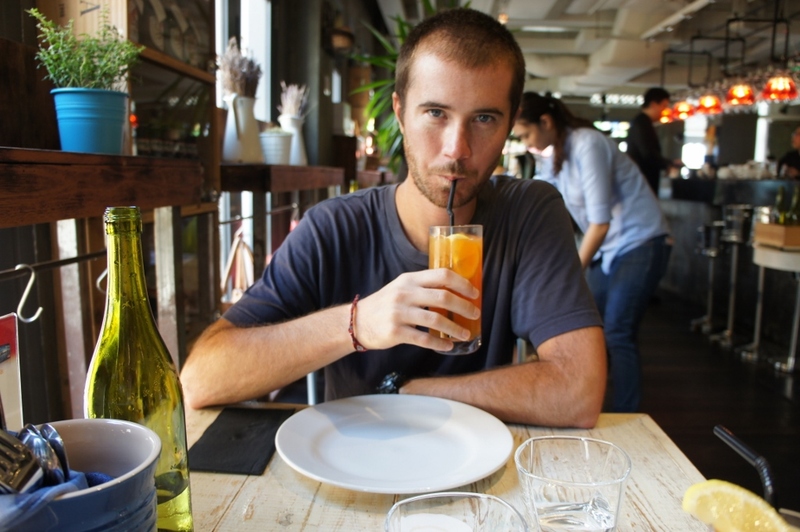 They are nothing like the food courts in the States filled with junk food, but instead serve delicious cuisines from all over the world. One of the most famous stalls in the Maxwell Street Center is the ‘chicken rice’ stall made popular by Anthony Bourdain. The chicken was so juicy, seasoned to perfection and tender, but it surprised us that it was served cold. The rice was hot and flavorful which helped bring up the overall score for the meal. It was really good but not Bourdain’s best reco. 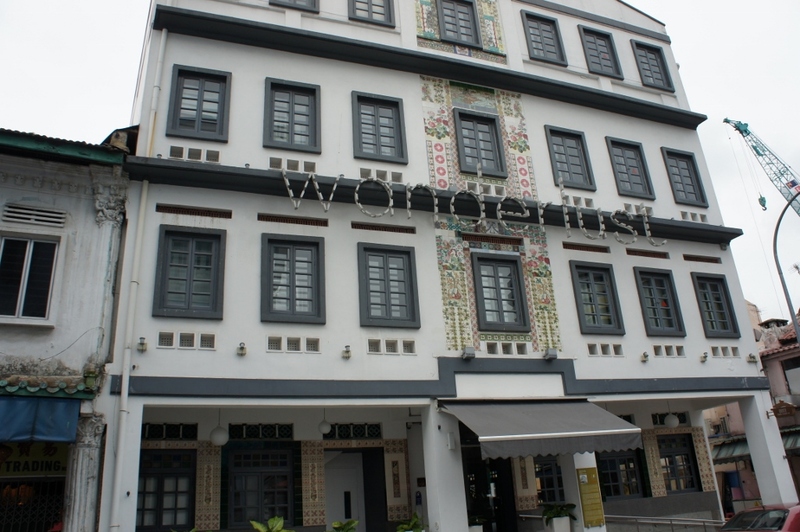 From Maxwell Street, we walked to what would become my favorite hawker center, Lau Pa Sat. They had so many food stalls to choose from and they all looked so good! We were pretty full so we only had one order of shrimp dumplings but they were so delicious that I find myself craving them even now. We walked past the Marina Bay Sands Hotel and this time, we took the elevator to the top for a quick look around. The views of the bay, ocean, river, skyline and gardens were spectacular. 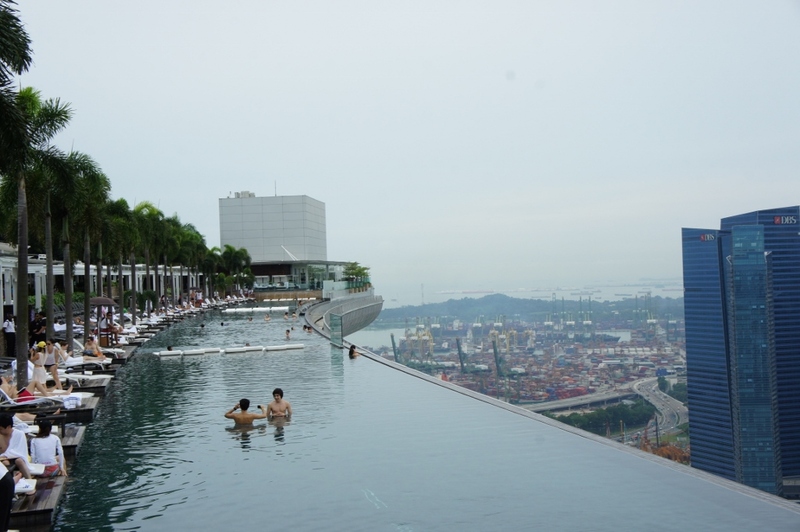 It would have been nice to be a guest at the hotel to use their rooftop infinity pool. On our way to the train, we stopped at Makansutra Gluttons Bay for a few fried chicken wings. 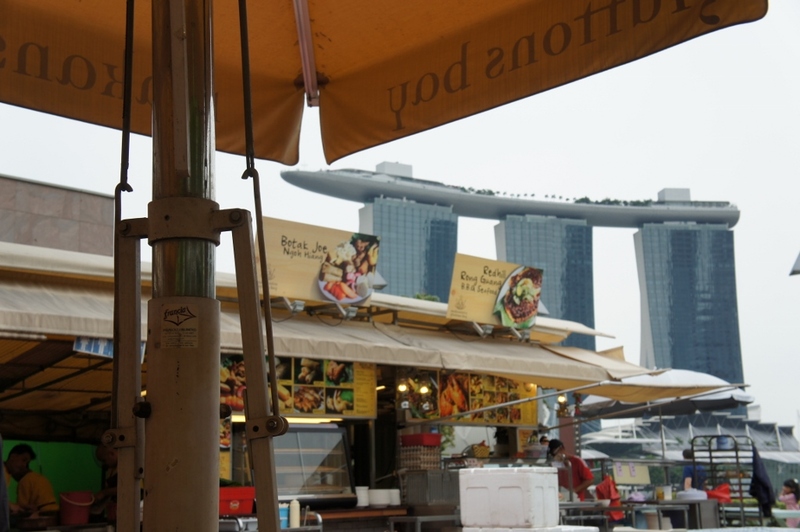 Although it was the most expensive hawker center with the least variety, it had the best view. We took a quick walk down Singapore’s most popular shopping street, Orchard Road, before heading back to Little India to seek refuge in our room. We made it out once more to a hawker center for dinner just a few blocks from our hotel for a tasty noodle dish. After two days wandering and eating our way through the city, we were thoroughly spent. We spent the rest of the evening enjoying the comforts of our room and prepping for the next leg of our trip. Wanderlust was our home away from home and quite honestly, one of our favorite places we’ve stayed. 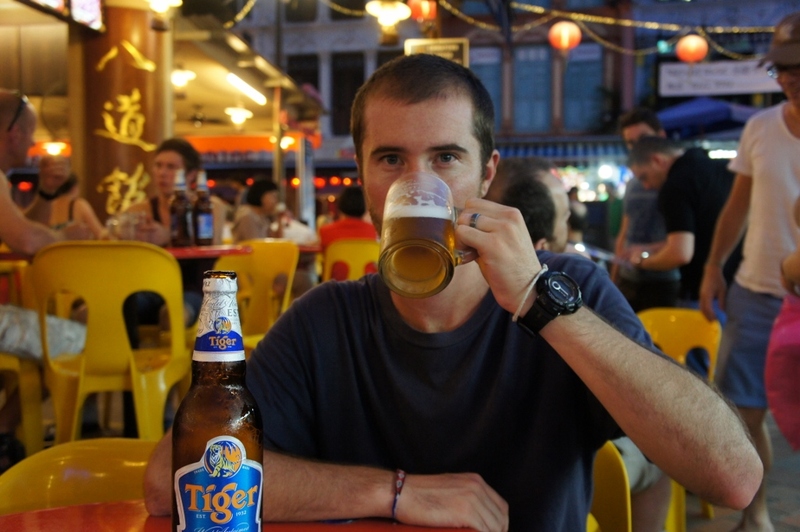 Since our time in Singapore was short, we liked that we got to stay in Little India which is a destination on its own. The hotel was within walking distance to two different SMRT stops making it a very convenient location to get to other places in the city (we also walked to/from the city center several times). From the marketing manager Mae to Cocotte’s Chef Anthony to the front desk, the entire staff was so helpful and very professional. If you are so inclined, one of their hotel ambassadors can show you around the city. 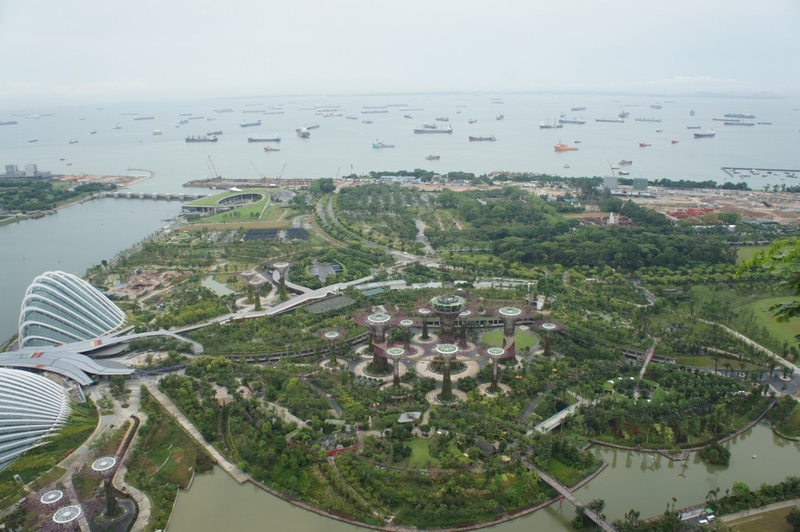 Each ambassador knows Singapore like the back of their hand and will take you around as if you’re a local, completely free of charge (just be sure to book before you arrive). 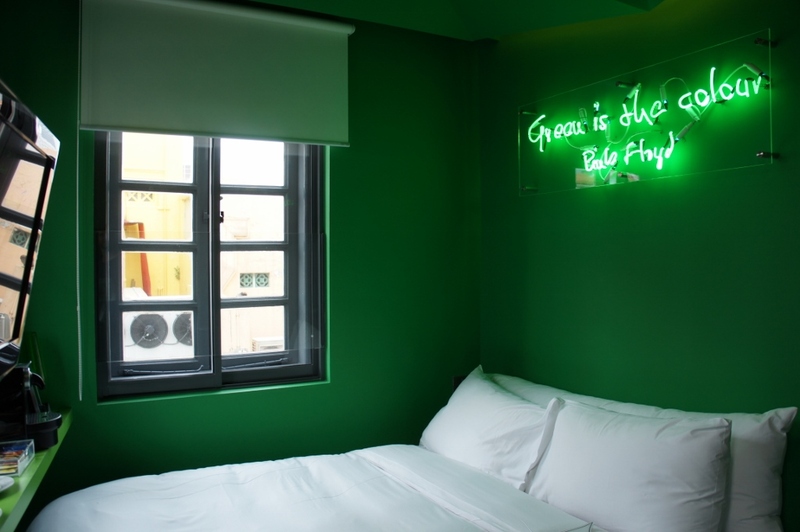 If you are suffering from a case of wanderlust, this hotel is for you. Whether you’re looking for a staycation or a creative atmosphere where you can rest your head, you’ll find happiness at Wanderlust. You can visit their Facebook page or website to see more pictures of their unique and creative rooms, make a reservation or learn more about the hotel. Enjoy! Disclosure: We received a complimentary night stay at Wanderlust and lunch at Cocotte in exchange for sharing our experience. These thoughts and opinions are completely our own.